Use this function to simplify the selected solid or sheet body by converting spline surfaces and spline edges to analytics where possible. The function also merges redundant faces and reduces tolerant geometry. Open the model and select Tools>Maintenance>Simplify Body. Select the solid or sheet body that you want to simplify. The Body Simplification Analysis dialog box appears, similar to that shown below. Notice especially the information in the Current column. 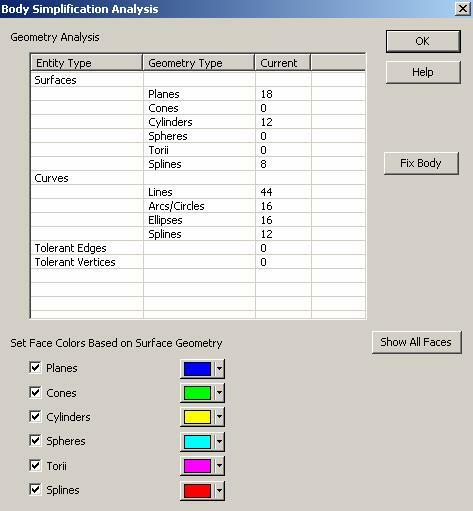 Select the desired options and colors under Set Face Colors Based on Surface Geometry. Click the Show All Faces button. The dialog box temporarily disappears and the selected colors apply to the faces. On the Conversation Bar, click the Accept button to save the colors, or the Backup or Esc button if you do not want to save the colors. The dialog box reappears. Click the Fix Body button. The selected entities are simplified. The dialog box shows information in the Before and Current columns. This information allows you see details that changed in the surface geometry, including merged faces or edges. Also, a new button appears called Show Changed Faces. This allows you to show just the changed faces, if desired. The Fix Body button is unavailable.